Unlike other martial arts Aikido is not about attack and defense. At it’s core it is about re-directing energy to create harmony instead of harm. It wasn’t always that way though. 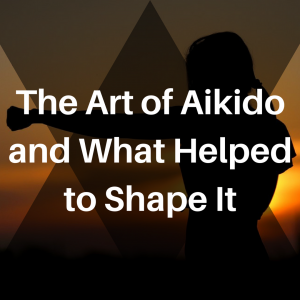 I tend to look at the evolution of Aikido as having two distinct eras. The first is pre-world war two and the second is post world war two. Pre-world war 2 Aikido had a very different flavor to it. Japan itself had a much more martial approach to life so it makes sense that this would have flowed into the early days of training in Aikido. Aikido at this time was made up from a variety of styles which the founder, O’Sensei studied such as Judo, Jujutsu and many others. The main teachings though arose from his training in Daito-ryu which was a combination of several martial arts including swordsmanship and spearmanship. A great deal of emphasis was placed on atemi (strikes) during this time which could be delivered by any part of the body to any part of an opponent’s body. After the war, things changed. There was less focus on the martial aspects and more emphasis on neutralizing an attack by using the energy of the attackers movement to neutralize them. Although many of the pre-war techniques were still applied it was the way in which they were used that softened the blow to an opponent. Atemi now became about leading an opponent’s mind rather than attempting to cause physical harm. When you lead an opponent’s mind you are able to effectively catch them off balance which makes it easier to disarm or pin them so as they do not harm themselves or others. While there are as many applications of Aikido as there are schools to be found it really comes back to the tradition of the Dojo you are training in and whose methodology they are following. There are still some Dojo’s that practice pre-war Aikido as that’s the way they like to train – and for some that will suit them fine. For others though, they are more drawn to the softer side of Aikido which is more about staying calm and relaxed and using little to no force against your opponent. In fact, the more relaxed you are the simpler it is to apply any Aikido technique with minimal effort yet your opponent will feel like the ground just disappeared from beneath them. The faster and more aggressively someone attacks you while you stay relaxed and alert, the more they will hurt themselves as you simply re-direct their energy back to them. The key here is to stay soft and relaxed. The moment you tense up then it becomes a battle of who is the strongest and true Aikido is never about a test of strength. That’s why modern Aikido works well for men, women and children of almost all ages. It is one of the only martial arts I know that you can start when you are a child and continue for as long as you like. om it. Keep in mind that the reason you start out training will most likely change over time. I know that my reasons for training have changed massively since I started. At first, it was about being able to defend myself and those I love in a world that continues to grow more aggressive and violent. Now, I train because it helps me to learn about myself so that I can become the best version of myself possible. For me, this means knowing how to stay relaxed no matter what’s going on around me or inside my mind or body.